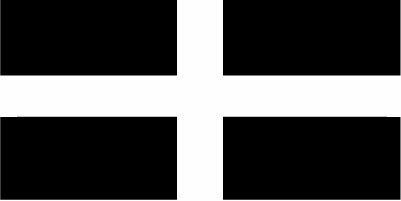 Cornwall’s patron saint, Perran or Piran, was said to have come from or studied in Ireland – a contemporary and possible student of Finnian of Clonard. 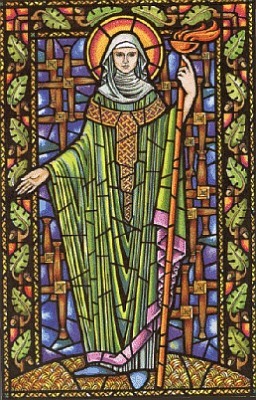 His name may derive from a Brythonic interpretation of the Gaelic name ‘Ciarán’ and he is therefore identified in some medieval hagiographies with both Ciaran of Saighir and (by later scholars) with Ciaran of Clonmacnoise, possibly on account of the geographical sphere of influence of Ireland’s great ‘Celtic Rite’ Abbey of Clonmacnoise. Both of these Ciaráns were said to have studied under Finnian. He is supposed to have lived and died in the 6th century, and to have created his first establishment at the place which bears his name: Perranzabuloe. Hagiographies: Life of St Piran (14thC) – This surviving hagiography of ‘Piran’ is actually a copy of the Life of Ciaran of Saighir with details of his life in Cornwall appended. For this reason, the two are believed by many to be the same. Another work by 17thC Cornish Catholic Nicholas Roscarrock gave accounts of Piran and his fellow local saints, some of whose legends he took from known folklore of the day. These have been published by the Devon and Cornwall Record Society, Ed. Nicholas Orme. Arrival from Ireland: Another popular legend says the saint was thrown off a cliff by pagans in Ireland. To ensure his demise they were said to have tied a millstone around his neck, but by divine grace etc this stone floated and Piran, thus saved by God, floated across to Cornwall and landed at the beach near Perranzabuloe/Perranporth where he established his ministry. There are similar curious hagiographic and folklore stories involving Cornish (eg – Petroc who supposedly floated from Ireland to Padstow on his stone altar) and Irish saints (eg – Declan of Ardmore, among others) and floating rocks… In the Isle of Man, there is a story about the Cailleach (Caillagh y Groamagh) that portrays her as an Irish witch thrown into the sea who washes up on a Manx beach at Imbolc/St Brighid’s day. Similarly, the Manx patron saint ‘Maughold’ was said to have been cast adrift from Ireland as a pagan and was Christianised upon landing in Mann… The ‘Irish Nennius’ also tells of a wonder in the Isle of Man – a rock which, although thrown into the sea, returns inland by itself. Such legends seem linked to a probable pagan theme of holy stones and the seashore. Columba’s legendary hagiography also has him making a stone float upon water. After the Theodosian edicts were enacted throughout the easternn and western Roman Empire in 439 CE, the official process of re-using pagan religious sites as Christian places of worship began in earnest. As paganism was a nature-landscape-ancestor-based religion, this process necessitated the re-interpretation of the oral history associated with these sites as well seeking a Christian narrative to replace that of the pagans at each site. Consequently it must have been fairly difficult for Christian officials to implement, as the laws gave little if any guidance as to how this might be achieved, save that sites, buildings and structures ought to be preserved for use by Christians. Having made paganism illegal, the laws were designed with Christianisation in mind, intended not to alienate potential converts. They were enacted with the metropolitan Romanised lifestyles of the southern Europeans in mind, and although the metropolitan centres of the British Isles were de facto Romanised by this period, these were islands in a pagan landscape that had its roots in a religion quite different to that of the southerners. What evolved over subsequent centuries was a slow assimilation of the principles, histories and legends of those that frequented and relied upon them in maintaining the spiritual dimension of their lifestyles. This appears to have been achieved by the propagandistic method of coding these principles etc into popular stories about ‘saints’ – Christian antecedent heroes who were supposed to have bought this far-off religion to the peoples of Atlantic Europe. The greatest success (perhaps unsurprisingly) in re-envisioning Atlantic paganism came out of Ireland, where there had been no significant Romanisation and miscegenation, thus allowing a more sensitive and cohesive approach to the Christianisation of pagan peoples. The repercussions of the end of the western Empire meant that Ireland was to provide the stable ideological base and models for establishing the conversion of much of Atlantic Europe: This would be subtly syncretic, and whereas Kings and nobles (and their metropolitan followers) were expected to follow a pious continental model of Roman Catholic christianity and abandon the trappings of paganism, their peoples were largely to be allowed to keep their feet in both worlds, although were nominally seen as christian. The stories of local saints’ lives that started to be generated from the 4-5th centuries onwards are therefore full of pagan details, as are various legends associated with the former pagan shrines they inherited. These were often written down for the use of clergy in establishing the canon for oral legend, which would still be the cultural mode of the vast majority (95%+) of illiterate ordinary people. Some of these have survived to modern times in written form, whereas others remain only in oral folklore. As many are realising, they contain a very significant amount of information for those seeking to recover the traditional religion of the Atlantic Europeans. The main operators who pushed this process – and almost made it official – are the Irish monks of the 5th-6th centuries and their inheritors of the 7th-9th centuries who consolidated this approach. Of all of the names of the most significant chancellors of this new university of syncretisation, surely the most significant were those of Finnian of Clonard and his students (including the ‘Twelve Apostles of Ireland’) who propagated a network of Abbeys throughout Ireland. Finnian’s great British compatriot and apparent co-worker was Cadog of Llancarfan, who appears to have taken care of business on the eastern shores of the Irish Sea. 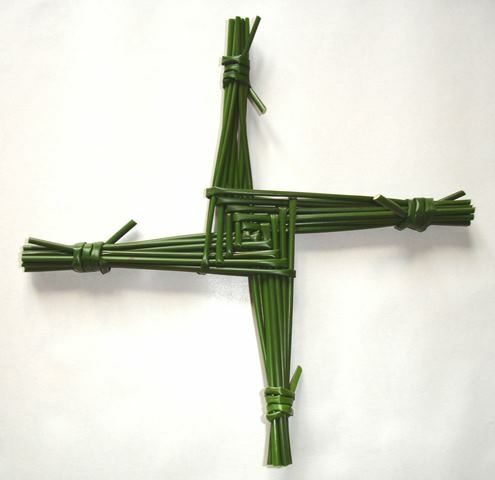 It is almost certain that the majority of these religious men were the brothers and sires of local tribal leaders if not kings themselves (Cadog was a king and Colmcille was a prince, for example) and therefore had access to the learned classes who were repositories of pagan knowledge and traditional learning. Although Finnian’s immediate fore-runners such as Patrick were often credited with Christianisation in Ireland, it was this next generation which were to provide the propaganda which pushed the Christian narrative back beyond the horizon of its advent and begin to replace paganism in earnest among ordinary people by using a concerted scheme. Although it had its origins in Britain, the Anglo-Saxon incursions and post Empire collapse of Britain pushed the emphasis of Christianisation into Ireland, Mann etc. This scheme, once established, then appears to have cascaded back outwards into Wales, Devon, Cornwall, Somerset, the Hebrides and the Isle of Man, western Scotland and Brittany during the 5th and 6th centuries, after which time the pagan invaders and settlers were becoming influenced by the international power and benefits of the Christian church, which continued the glory of the Roman imperium, modelled on Augustine of Hippo‘s allegorical and historically aspirational treatise known as ‘The City of God‘. The historicity of these Atlantic holy men and women is often difficult to ascertain, and many of the sources that name them are much later than the supposed dates of their ministry. In addition, the details of their lives (where recorded in manuscripts or folklore) are often so full of fantastical or pagan details that we sometimes have to wonder if their existence was only required to be legendary. All of the saints operated under assumed pseudonyms, adding to their mystery, and perhaps their effectiveness as faceless vessels of the new order…. The Winter Solstice is nigh: 21st December at 17.11 to be precise! This, the shortest day, marks the onset of the midwinter festival of darkness and light in the northern hemisphere, although the celebration is largely superimposed upon by the syncretic festival of Christmas: the birth of a Son for the birth of the Sun, as it were… The solstice is when the Sun appears at its minimum elevation in the sky, and travels its shortest path from east to west after rising, hence the derivation of the word from latin: Sol Stitium , meaning the ‘sun stands’. Christmas has a traditional period lasting 12 days, and in more ancient times this was marked by for what was for most people, the only true prolonged holiday of the working year. 12 is itself an interesting number in this context, as there are 12 months in the solar year, and people used to fancy that they might predict the weather for the coming year by ascribing the conditions on each day of the festial period to the equivalent month. 12 was the number of the Apostles of the Middle Eastern religion’s stories of their ‘bringer of light’. So … what do the twelve days mean? It is necessary to examine the Christian and Pagan aspects of the period. For Christians, the period starts at nightfall on Christmas Eve (24th Dec) with the festival of Nativity and ends with the festival of Epiphany (celebrating Christ’s first worshipping as God in Nicene christianity), celebrated 12 days later. The cosmic (ie – pagan) reason for the 12 day festival probably lies in our ability to perceive the lengthening of days following the Solstice. 12 days after the solstice, you can definitely tell things are getting lighter again and its time to get back to work, but before this the rate of change appears so slow that our inner clocks (and those of nature) can barely perceive the difference. When the Sun stands, and the days are dark, it is time to make fires and bring light and be merry – see you on the other side! Catharism – a late flowering of pagan doctrine in Europe? The ‘Cathar’ religion reached its height of popularity and notoriety in southern France, parts of Germany and northern Italy between the 12th and 14th centuries. It was founded on a belief in two gods – God in Heaven and a God of the Earth. Essentially Christian, it held that the good Heavenly God represented the redeeming god of the New Testament, whereas the bad Earthly God was that of the Old Testament – the angry creator of the world, who Cathars identified with the evil principle – Satan! If you are familiar with my breakdown and interpretation of ancient Atlantic European (‘Atlantean’) paganism so far, you might recognise this Cathar dualism as being largely similar to what I have proposed, albeit in a Christian guise! The movement believed that souls were those of Angels who were destined to be continually reincarnated in corrupt, evil worldly flesh until they could attain a state of religious perfection, when they might be released from the cycle and go to Heaven! Catharisms leaders were the ‘Perfects’ who had attained such a state while in the earthly form, and when the Catholic church sought to eradicate the movement (the Albigensian Crusade from 1209-1229) observers were amazed at how willingly adherents accepted death, echoing the observations of Romans when fighting the Atlantean Celts of Gaul and Brittania 1200 years before. They rejected baptism, the sacraments, the eating of meat, and the swearing of oaths (which they might inadvertently break in another life, denying them perfection). Catharism’s origins are usually traced by historians and commentators back to the Paulician and Bogomil dualist christian movements based on the older doctrine of Manicheanism from Eastern Europe and the Near East. This opinion demands revision, as it is based largely upon the apparent similarity with these branches of the Christian faith. Of greater interest are the similarities between the religion’s doctrines and those of pagan Atlantic Europe that I have been examining. Catharism can speculatively be proposed as a resurgent interest in certain ideas of the old Atlantic paganism which had developed Christian clothes (in fact as much as with many aspects of Roman Catholicism!). It was identified as an emerging movement in its heyday, which coincided with the medieval Renaissance of classical pagan learning in Europe, as well as upwellings in popular fads and cultures in religion and the arts. For its inception to have been an attempt by a shadowy group of aristocratic pagans to reignite the pre-christian worldview of ancient northwest Europe, would be one possibility; after all it was supported by such networks. More reasonable though, was that it was a case of a good idea that wouldn’t die so easily. The reason to consider all of this is the popularity at the time of the telling of Europe’s old pagan stories – the Arthurian romances and tales of Parsifal, Siegfrid etc – many of which were riding the wave of popular troubadour culture that emerged from the Cathar lands in and around Occitania in southern France! Pagan conspiracies by shadowy aristocratic groups to kick out Christians were not unheard of (take the Vikings, for instance), and in the 15th and 16th centuries there was a good deal of official paranoia about such conspiracies among ordinary people which led to the infamous witchhunts. In fact, churchmen had been preoccupied with this issue for a good deal longer – right back to the time of first Christianisation. 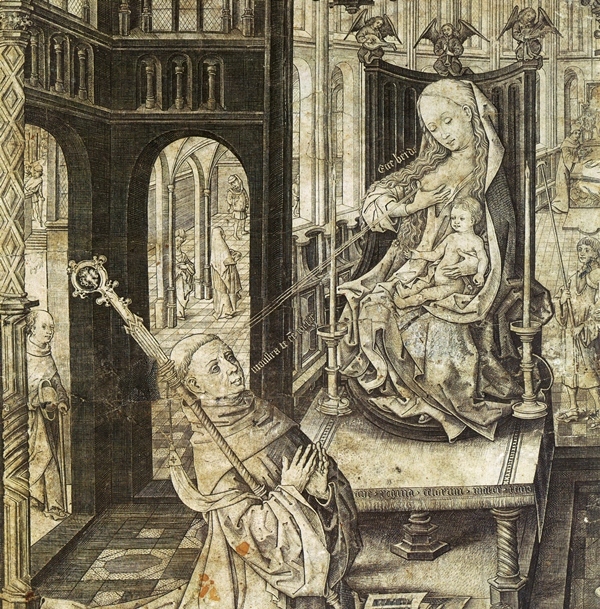 To the church, the social elites had always been unhealthily preoccupied with ‘pagan’ knowledge and traditions and complied with religion only where it suited them; Conversely, the obedient and thankfully illiterate peasantry dutifully accepted what the Church served to them, but their ‘ignorance’ meant that they continued to entertain pagan magical practices and beliefs. Catharism seemed to unite both groups in its heresy, and was therefore eventually annihilated with violence by the Church.